Street Chaplains work in partnership with other local professional agencies such as the Police, local council and Safer-City Partnership. 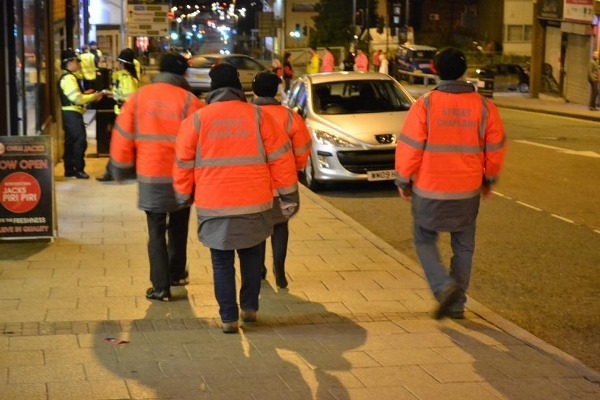 They also provide extensive training for their volunteers, that covers all aspects of working in the community (First Aid, Knife Crime etc) Street Chaplains are a non-statutory uniformed, visible presence that offers reassurance and reduces the fear of crime. We are looking to recruit people over 18 who have a desire to make a significant difference in their communities. The aim of the Street Chaplins is to provide help and support to those who are in need and vulnerable, or simply to connect with others. All volunteers receive free training that covers all the essential aspects of the work. The training is delivered by professionals who bring expertise and insight into the challenges that are faced in North Staffordshire. Each volunteer receives a uniform that is worn whilst on patrol. Each volunteer becomes part of the dedicated team and will work on patrols at least once a month. This involves both night and day time patrols. Street Chaplains work out of a City Centre lounge venue which provides an excellent base to work from as it reaches out into the city in a non threatening location. We are supported and funded by the generous gifts of local churches, individuals, local police and council agencies and constantly look for community funding and local financial support.